Impressive red-white wedding invitations coming in a red board with a word pattern and your personalised wording printed on a white pearlised plaque. 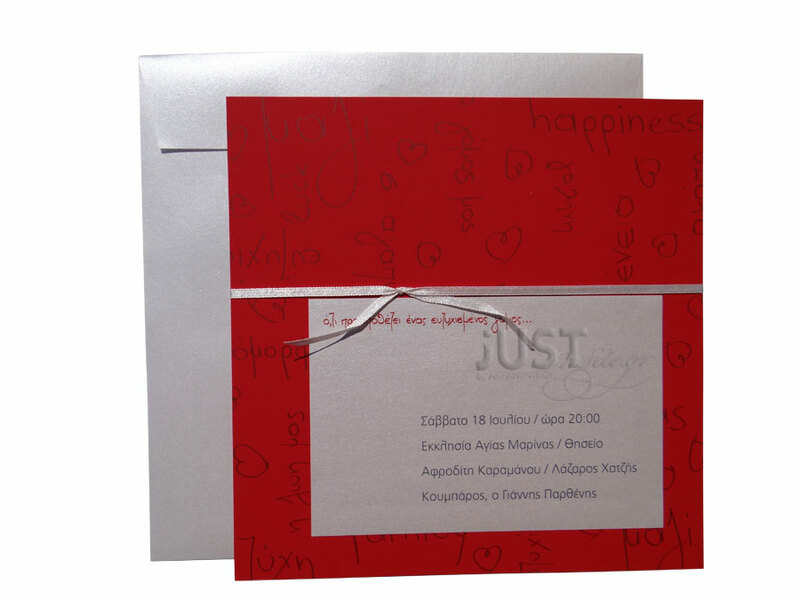 Your personalised invite is printed in soft red-grey colour and the design is finished with a thin white satin ribbon. The matching square envelopes are white pearlised paper. Size: 20 x 20 cm. https://www.preciousandpretty.com/2017/10/wedding-invitations-in-deep-red-color-A1005.html Greek Wedding Favors|Orthodox Crowns|Stefana|Baptism Invitations Wedding invitations in deep red color A1005 Wedding invitations, in deep red color, finished with an elegant thin white satin ribbon. Product #: Greek Wedding Favors|Orthodox Crowns|Stefana|Baptism Invitations_6193690082550946529 5 stars out of 5 reviews.